With all the buzz leading up to Basel, and Rolex teasing a video clip of a jubilee-style bracelet, it’s safe to say we’re happy with the end result—a new GMT-Master II on jubilee with a Pepsi bezel and an updated caliber. The best part? It’s made of steel rather than any precious metals, keeping its pricing down to a reasonable (for Rolex) CHF 8,800. The last time we saw a Pepsi-bezel GMT like this on a jubilee bracelet it was only available in white gold, and Rolex has spent a fair bit of time fine-tuning the new watch since then. 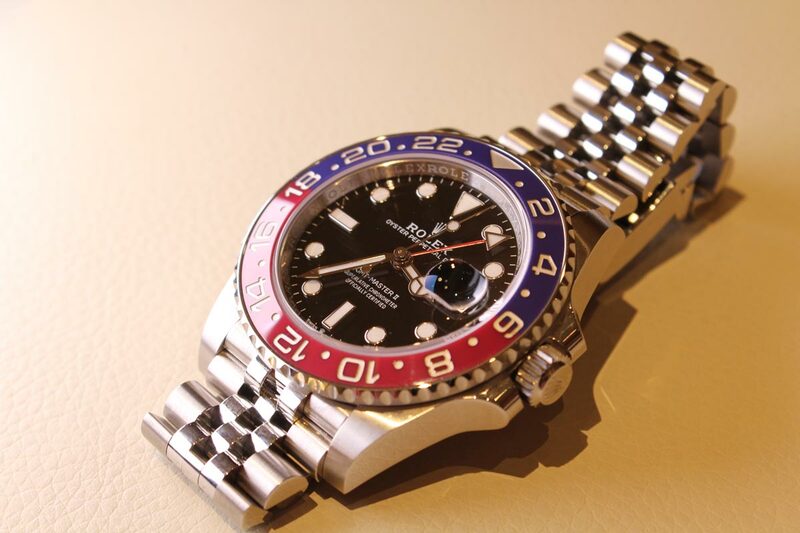 Here is the latest watch by Rolex, a GMT-Master II Pepsi Jubilee. For starters, the new caliber 3285 movement brings all of the most up-to-date Rolex movement technology into the GMT caliber, among other things upping its power reserve to a healthy 70 hours. The jubilee bracelet on this GMT-Master II Pepsi has also seen a bit of a redesign, removing the hard-edge end links from past versions in favor of appearing as though the bracelet runs straight into the case. It still uses a conventional spring bar setup for the connection, though we were sad to hear from the Rolex communications team that owners will not be able to swap this bracelet to an Oyster bracelet, should they wish to. While I’m sure Rolex has their reasons for this, it does seem like a bit of a foolish move on their part. In hand (and on wrist) the new GMT-Master II Pepsi is pretty hard not to love. Rolex’s jubilee bracelets are hands-down one of the most comfortable metal bracelets on the market, only rivaled by the integrated bracelet of the Patek Philippe Nautilus. The classic 5-link design remains true to the first jubilee bracelet produced by Rolex back in 1945 for the Oyster Perpetual Datejust, though obviously refined to a modern standard. Compared with the vintage-era jubilee bracelets often seen on vintage GMT-Master models, the new version doesn’t have that same worn and floppy feel (something that is either loved or hated depending on personal preference), but given the shortness and configuration of its links the piece has a level of on-wrist compliance that simply has to be tried on to be appreciated. Crafted of 904L stainless steel, or Oystersteel as Rolex has come to call it recently, there’s just enough heft to the new release that it feels substantial without that dead-weight feel of similar offerings in gold. The GMT-Master II Pepsi Jubilee is the watch that was released at Baselworld 2018. In terms of other dial details, there’s a certain amount of repurposing afoot, though not in a bad way (like we saw with certain Audemars Piguet Royal Oak Offshore releases this past year that came across as the “what’s in the spare parts bin” method of watch design). The deep black gloss dial of the GMT-Master II Pepsi is devoid of accent color in any of its text, meaning it’s the identical twin of the much loved GMT-Master II BLNR “Batman”, as well as of the white gold Pepsi GMT Rolex launched back in 2014. Looking at the current catalog it seems that this earlier model, the 116719 BLRO has been superseded by a blue dial variant (that we aren’t as keen on, to be honest). It’s also quite clear that the Cerachrom Pepsi bezel insert of the new jubilee-clad model is a crossover from the 2014 model, though not the bezel itself on account of being crafted from non-precious metals this time around. On the topic of said bezel, it’s always a bit of a surprise to see the distinct difference between stock imagery and actual product when it comes to colors. In the stock photos the bezel of the new release appears to be fairly dark and muted, whereas in person they are a fair bit more vibrant, and more notably more true-to-original spec of Pepsi bezel GMTs of the past. So, minor gripes aside—specifically the lack of compatibility of this new model with the standard Rolex Oyster bracelet—the new GMT-Master II Pepsi on jubilee bracelet is no doubt going to be another Rolex homerun. Will they lose a few buyers on account of it not being available on the Oyster bracelet? Possibly. Will they convert a ton of new Rolex enthusiasts that have been dying for a new option of steel GMT? Absolutely. 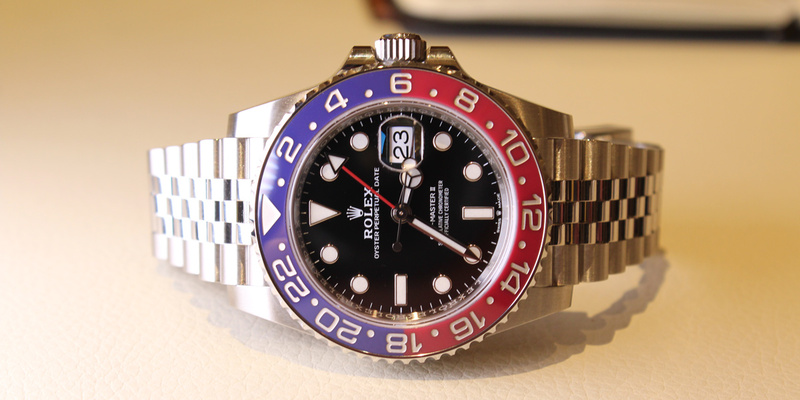 Will it piss of recent buyers of the white gold Pepsi GMT who had no idea this new release was coming? Odds are pretty good, but we suspect that will be a pretty low headcount overall. At the end of the day, we’ve gotta tip our hat to Rolex for bringing a fairly surprising release to market for the first time in a good while now. It still doesn’t satisfy the many who are still waiting for the Coke bezel to make its triumphant return, mind you, but at the end of the day, this new “entry-level” Rolex was a smart move.